Samsung Galaxy Alpha C850 lowest price in Pakistan is Rs. 29,999. The price was updated on 18th April, 2019. You can read price, specifications, and reviews on our website. TypeDesign Type called form factor refers to a mobile phone's size, shape, and style as well as the layout and position of major components of phone. There are three major form factors seen in mobile phones => bar phones, folding phones and sliding phones. SIMSIM (Subscriber Identity Module) is a small card that contains mobile network subscriber's account information. This allows the phone using the card to attach to a mobile network. The SIM card is most commonly associated with GSM and UMTS mobile networks. Moving a SIM card from one phone to another allows a subscriber to switch mobile phones without having to contact their mobile network carrier. SIM cards can also be used by a phone to store limited amounts of data, such as phone numbers and text messages. Display ColorsDisplay Colors is refers to the number of different shades of colors that the screen is capable of displaying => 64K colors, 256K colors and 16 million colors, Obviously 16M is highest available range of colors and better than others. Pixel DensityPixel Density (PPI) is refers to the concentration of pixels on a particular display, measured in pixels per inch (ppi). Pixel density is calculated by dividing the diagonal pixel resolution of a display by its diagonal size, higher pixel density better display quality. Display ProtectionDisplay Protection => Gorilla Glass is a special alkali-aluminosilicate glass shield with exceptional damage resistance that helps protect mobile displays from scratches, drops, and bumps of everyday use, It is always better to go for a smartphone with Gorilla Glass for that added protection and peace of mind. PrimaryCamera is able to capture photographs and usually videos, The most important characteristics of a camera are the resolution (measured in megapixels), lens focus type (fixed or automatic), higher megapixel cameras are known to capture higher quality photos, but not always a good measurement of the photos quality. Operating SystemOS => Every computer system run on a base software called Operating System (OS). Operating System controls all basic operations of the computer (such as smartphone, PDAs, tablet computers and other handheld devices). The Operating System allows the user to install and run third party applications (apps), apps are used to add new functionality to the device. ChipsetChipset is a group of integrated circuits designed to perform one or a more dedicated functions, often with real time computing constraints, Popular smartphones are equipped with more advanced embedded chipsets that can do many different tasks depending on their programming. CPUCPU (Central Processing Unit) mostly known as processors, CPU processes instructions in order to carry out certain functions that make your device operate properly. Processors are often described as the brain of computers, smartphones and tablets, Smartphones and tablets rely on processors to carry out their every task, Processors are an incredibly important factor in selecting any type of computing device, including your smartphone. GPUGPU (Graphics Processing Unit) is a single-chip processor designed to rapidly manipulate and alter memory to accelerate the creation of images in a frame buffer intended for output to a display, This includes things such as lighting effects, object transformations, and 3D motion. RAM (Memory)RAM (Random Access Memory) is a type of computer memory that can be accessed randomly, any byte of memory can be accessed without touching the preceding bytes that allows information to be stored and accessed quickly from random locations. RAM is the most common type of memory found in computer systems, smartphones, tablets and other electronic devices. Internal StorageInternal Storage is a data storage space (flash memory) mostly used in smartphones, tablets and other electronic devices where operating system, apps, music, photos, videos, files and other user data Is stored. Card SlotMemory Card Slot is a special slot for inserting a memory card. Memory cards allow you to expand the phone's built-in memory, A memory card (sometimes called a flash memory card or a storage card) is a small storage medium used to store data such as text, pictures, audio, and video, for use on small, portable or remote computing devices such as mobile phones, mp3 players, digital cameras. SensorsSensors are electronic components that detects and responds to some type of input from the physical environment. The specific input could be light, heat, motion, moisture, pressure and location, The output is generally a signal that is converted to use in computing systems, a location sensor, such as a GPS receiver is able to detect current location of your electronic device. BluetoothBluetooth is a wireless communications technology for exchanging data between mobile phones, headsets, computers and other network devices over short distances without wires, Bluetooth technology was primarily designed to support simple wireless networking of personal consumer devices. Wi-fiWi-Fi is a popular wireless networking technology using radio waves to provide high-speed network connections that allows devices to communicate without cords or cables, Wi-Fi is increasingly becoming the preferred mode of internet connectivity all over the world. GPSGPS The Global Positioning System is a satellite-based radio navigation system, GPS permits users to determine their position, velocity and the time 24 hours a day, in all weather, anywhere in the world, In order to locate your position, your device or GPS receiver must have a clear view of the sky. NFCNFC (Near field communication) is a set of standards for smartphones and similar devices to establish peer-to-peer radio communications with each other by touching them together or bringing them into proximity, usually no more than a few inches. GPRSGPRS (General Packet Radio Service) is a packet oriented mobile data service on the 2G and 3G cellular communication system's global system for mobile communications (GSM), Generally, GPRS is used for the purpose of wireless data transfer, such as sharing pictures and videos or browsing the Internet via a mobile phone connection. EDGEEDGE (Enhanced Data GSM Environment) is a wireless network technology generally considered the next step in the 2G network offers data transfer rates up to four times faster than ordinary GSM networks, Generally, EDGE is used for the purpose of wireless data transfer, such as sharing pictures and videos or browsing the Internet via a mobile phone connection. Battery TypeBattery Type => Cell phones run on various kinds of batteries depending on the manufacturer, phone size or shape and features. There are basically four types of cell phone batteries => Lithium Polymer, Lithium Ion, Nickel Metal Hydride and Nickel Cadmium. CapacityBattery Capacity is a measure (typically in Amp-hr) of the charge stored by the battery, and is determined by the mass of active material contained in the battery. The battery capacity represents the maximum amount of energy that can be extracted from the battery under certain conditions. StandbyStandby Time is the total amount of time that you can leave your is fully charged, turned on and ready to send and receive calls or data transmissions before completely discharging the battery. Talk TimeTalk Time is the longest time that a single battery charge will last when you are constantly talking on the phone under perfect conditions, Ambient temperature and highly dependent on the cellular network environment such as the distance to the closest cell network tower. - All prices listed through stores are in Pakistan Rupees PKR. - The latest price of Samsung Galaxy Alpha C850 was obtained on 18th April 2019. - The price is valid in all major cities of Pakistan including Lahore, Karachi, Islamabad, Rawalpindi, Faisalabad and Multan. Please watch out on respective websites for any changes in terms and conditions. 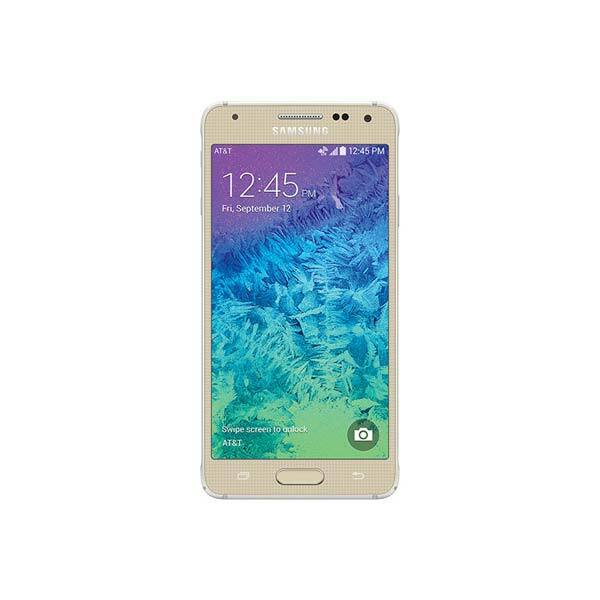 - Buy Samsung Galaxy Alpha C850 online in Pakistan for the lowest price. There are different payment options for online buying. You can also avail the options of Cash on Delivery (COD) and Online Credit Card Payment on purchase of this product.